Quinta da Barca resort with swimming pool tennis and soccer field. Marina Cávado River. Property 11: Quinta da Barca resort with swimming pool tennis and soccer field. Marina Cávado River. A real home from home! Stunning views, pool, Wifi, BBQ, satellite TV, walks..
Property 21: A real home from home! Stunning views, pool, Wifi, BBQ, satellite TV, walks.. The apartment is in a regular building where local people live, within walking distance to Braga&rsquo;s historic Center. It was clean, spacious, with updated bathrooms. We were met by Maria and her English speaking daughter, Helena, at the apartment, and were given all of the information needed to enjoy our stay, along with a tour. We were only one couple, so didn&rsquo;t need the second bedroom and bathroom. There would have been lots of room for another couple or a family travelling together. The furnishings and decor were very nice, warm colours and comfortable seating. 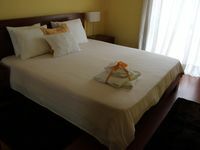 There is a large dining table, as well as a smaller table and chairs in the kitchen.The king size bed was comfortable. The kitchen was well equipped for self catering. The only negative is that there is no assigned parking. Although there is parking in the immediate area it is on a chance basis. We would recommend this apartment for anyone travelling to Braga and area. Uma excelente surpresa. Apartamento muito bem localizado, muito bem decorado e excelente limpeza. Com uns miminhos de cafe, chocolate.. Parabens. Continue o excelente trabalho.